Drizzly grey days call for spectacular shoes. 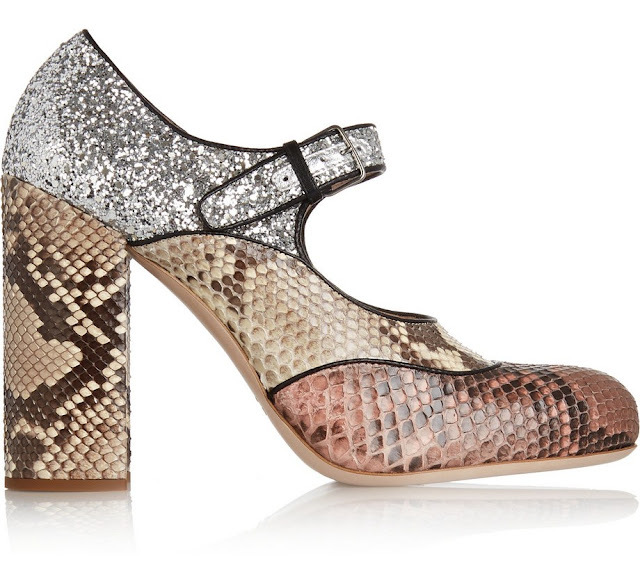 These Miu Miu glitter python Mary Jane pumps, crafted in Italy, caught my eye on Net-A-Porter. Even though they're obviously statement shoes, they're also made in wear-with-anything neutrals: colourblock antique rose, cream and brown python, finished with sparkling silver glitter-coated leather, black piping, a buckle fastening and a chunky heel. They were worn on the Paris catwalk with eclectic 50s and 60s minis, high-shine leather skirts and bouclé tweed for a texture clash. No one does Mary Janes quite like Miu Miu and whilst they're out of my price range and I don't need them, a girl can dream.